In honor of St. Patrick’s Day, I thought I’d tell you about one of my very favorite summer-blooming annuals: Bells of Ireland. Turns out that growing Bells of Ireland from seed is very easy. They make a great addition to the summer garden! Why Grow Bells of Ireland? Deceivingly simple to grow, the blossoms of Bells of Ireland, Moluccella laevis, are real crowd-pleasers. But not for their flashy color (they’re green). Instead, they garner such attention for their sheer individuality. Looking like no other flower out there, Bells of Ireland stand tall and shout out their uniqueness by just being one heck of a fun plant. They’re a fantastic addition to garden beds and have a lovely, sweet, vanilla-like fragrance. Thankfully, growing Bells of Ireland from seed is very easy. To grow them, sow Bells of Ireland seeds (available here) indoors under grow lights 8-10 weeks before your average last frost date, which here in Pennsylvania happens to be right around St. Patrick’s Day! Use a high quality seed-starting potting mix and simply sprinkle the seeds on top of the soil. Bells of Ireland seeds need light to germinate, so don’t cover them. Water the seeds in well and place the seed tray on a seedling heat mat to raise the soil temperature and speed germination. As soon as the Bells of Ireland seeds germinate, remove the seedling heat mat. Set the grow lights just two to three inches above the tops of the seed flats and run them for 18-20 hours per day. Continue to water the seedlings as necessary; do not let them dry out between waterings. Every three weeks, water the seedlings with a diluted liquid organic fertilizer formulated for young plants, such as this one. Then, when the danger of frost has passed, transplant the seedlings outdoors after hardening them off. When growing Bells of Ireland from seed, you should also be aware that the plants form a tap root and resent transplanting. Because of this, don’t disturb the roots when moving the seedlings out into the garden. And don’t be surprised if the plants are a little bit shorter than promised their first season. In subsequent seasons, when the plants return to your garden from seed dropped by the previous year’s blooms, they’ll reach their full potential. When planting Bells of Ireland, choose a location that receives full sun to partial shade. Average garden soil is best, but avoid water-logged areas or those that are excessively dry. Bells of Ireland are self-sowing so as long as you let them drop seed, they’ll return to your garden every year. Their floral spikes look quite striking in floral arrangements. 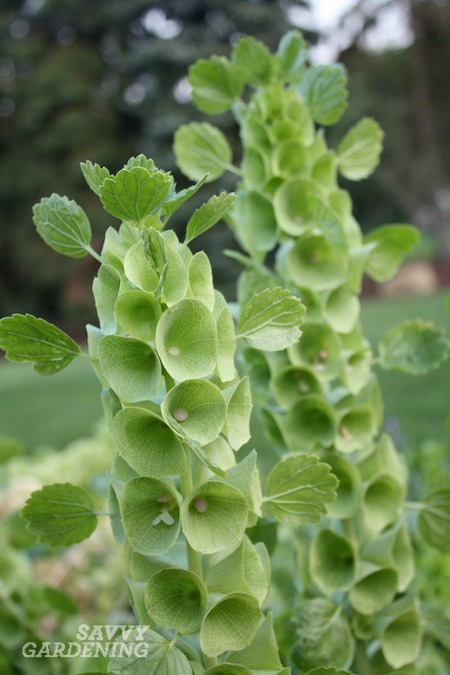 Bring the luck o’ the Irish to your garden this year with Bells of Ireland!